As you can see a lovely sideboard that would suit most modern interiors. We will describe any serious imperfections. Feel free to collect from Aston in Birmingham. Nothing that spoils the cabinet in anyway. Original glass flutes decorate the middle panel along with a scrolled mirrored pattern around the edge of the glass doors. This really is a great looking piece and am sure wherever it’s placed it will look spot on. A stunning pair of original 30’s bedside cabinets, finished in walnut veneer. Sits on a plinth base. Signs of minor wear consistent with age and use. NOTE very minor crack to veneer about 20cm long on the side of one of the cabinets. Art Deco vintage 1930s Walnut Veneer Bow fronted glass display case Retro. Solid and veneered walnut finish. A lovely piece. Top display shelf. Great looking cabinet that’s all in very good condition with no obvious marks, This cabinet is all solid and and well made. Original Walnut Double Bow Fronted Drinks Display China Cabinet with Mirror Back to the display cabinet and the drinks/cocktail cabinet at the top. Also has a patterned glass shelf in the drinks cabinet at the top (see photos) Original lock and key to the display cabinet. Art deco walnut veneer writing desk with ball & claw feet. As the UK's number one heart charity, the cutting edge research we fund has already made a big difference to people's lives. Every penny you spend or donate takes us closer to beating heart disease for good. ART DECO style Vintage Mid Century Walnut COCKTAIL CABINET. Collection in person only. Fantastic Art Deco design. Solid and sturdy. Plenty of storage. Little detail on the front of two handles is missing. Here I have my late grandfathers 1950s cocktail cabinet, made from solid walnut, very heavy lovely mirrored original interior along with the original keys and locks. 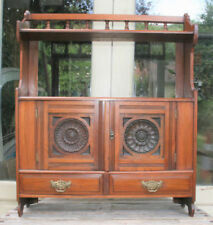 beautiful piece of antique furniture. Collection only! Cash on collection only UK buyers only. Lovely art deco cocktail cabinet. Auctiva's FREE Counter. Walnut Glass late 1930's / 40's Drinks / Cocktail Cabinet with two Glass Shelves. Original Key. (Collection in person only). Its walnut. Another Double Wardrobe with shelves tie/trouser rack. A Really Good Looking Little Pot Cupboard. Overall it's a nice little cupboard with the odd mark here and there but nothing you wouldn't expect for an item of age etc. In Solid Walnut. The cabinet is in really nice order overall, there are a few small age related marks on the top ( see photos ). I have had this cabinet for more than 30 years it was bought at Tenants auction rooms. It is a beautiful piece of furniture, but it does have some marks and scratches on it. It could easily be restored to it's original glory with a bit of love and attention. Measurements H: 4'3" W: 3'3" D: 1'6" I am selling it because we are moving house and down sizing and there will be no room for it. Depending on area we could deliver for a small fee. Beautiful looking vintage display cabinet- walnut wood & glass doors. Doors has the original keys in working condition. Inside there are 2 x glass shelves. H120/ W90/ D37 ( from foot to foot is 100cm widths) Its kept and well looked after it. There are major little scratches . Glass shelves and doors are perfect. Only reason of selling as it doesn't fit in our modern style kitchen. This lovely side cabinet has a lovely burr walnut top with moulded edge and burr walnut door with a brass drop handle having a centre shelf to the interior all supported by short queen anne style legs. This Art Deco display cabinet is a very good quality piece of furniture that dates to the 1930s. The interior is lined with non original patterned wallpaper, and it's fitted with 2 removable but not height adjustable glass shelves. 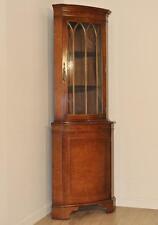 Tall Walnut Display Cabinet With Inverted Cornice. Two Astragal Glazed Doors, Two Internal Glass Shelves With Burr Walnut Panels Beneath. Standing On Claw And Ball Legs. Here we have a stunning and rare matching pair art deco Walnut quarter veneer Bedside Cabinets complete with a single drawer to each one. Made of Oak with the Walnut quarter veneer to the top and front the bottom cupboard has a single deciding shelf inside and an art deco wooden door handle, and the drawer has a single bakelite amber pull knob . 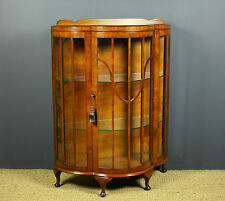 Art Deco Display Glass Cabinet in Walnut - completely refurbished. Collection in person only. Mid 20th Century Art Deco Style Cocktail Cabinet by Rivington. 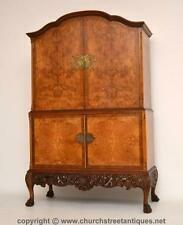 This is a great looking period piece with exceptionally attractive walnut veneers. The bottom section of the cabinet which is generously sized with the original bottle holders to cater for all your bottle drinks. A very nice looking burr walnut display cabinet / drinks cabinet w ith a carved trim around the top a nd along the bottom, the cabinet had2 glass doors either side with adjustable height glass shelves then a further 2 central doors with a shelf behind and two drawers below. Deco inspired walnut veneer display cabinet, sliding glass doors with floral transfer design, pair of glass shelves. Therefore, you need to arrange your own assistance to load the item indoors. KERNOW FURNITURE LTD.
YOU WILL NEED TO HELP THE DRIVER UNLOAD. Vey nice piece - great design. This walnut veneered display cabinet is a good quality piece of furniture that dates to the 1930s. There's also a diagonal crack (pictured) at the bottom right hand corner of the left hand door, i.e at the bottom right hand corner of the long right hand pane of glass. 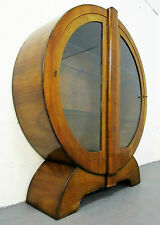 A stylish Art Deco arrow shaped walnut and contrasting ebonised detail display cabinet. Made by Hubbinet. Circa 1930s. The doors work well and retain the original key. The doors have slightly warped with age, as shown in photograph number 11. Art Deco Display Cabinet with original glass shelves and keys. If you would prefer to collect yourself that is fine by us. DEPTH 47cm. Both doors are lockable an a key is supplied. HEIGHT 144cm. WIDTH 77cm. Stunning deco cocktail drinks cabinet, with mirrored interior, 2sliding mirrored drawers, walnut Veneer, photos don’t do it justice, cupboard section below, ornate carved pediment, and apron. Impressive piece, welcome to view, height 176cm, width 113cm.and depth 48cm .small piece of veneer missing from bottom door see photo. Listed for collection but can quote for delivery. All drawers and the cupboard have there original ornate handles. With lots of useful solid wood drawers with all original brass handles and a small cupboard with working lock and key, middle shelf and display top it is a versatile piece of furniture It is a lovely warm honey brown colour and is in ve ry good condition, may have the smallest of marks as it is pre –owned. The cabinet has 2 fixed shelves and 2 lockable doors which still has the key. It has a fantastic shape and style to it a solid sturdy well made piece. Height - 116 cm.